In this project, we will build a night light circuit using a NAND gate chip. A night light circuit is a circuit in which a light will turn on when the environment becomes dark. It is a popular commercial product that is used in many places such as for backyard lights for when it gets dark for automatic illumination. The circuit is very basic. The component that will allow us to detect light is a photoresistor. We will use a photoresistor's light-sensing ability to detect whether the circuit is exposed to darkness or bright light. How this works is that a photoresistor's resistance changes in proportion to the amount of light it is exposed to. In darkness, it has very high resistance. In bright light, its resistance drops dramatically. If placed in a voltage divider circuit with a fixed resistor, we can exploit this resistance-altering behavior so that when connected to a NAND gate, we can produce a HIGH output when the photoresistor is exposed to bright light and a LOW output when the photoresistor is exposed to darkness. All of this will be explained in detail below how exactly this works. But realize that a photoresistor's resistance-changing ability allows us to distinctly know whether it is exposed to darkness or bright light. Knowing this, we can effectively build a night light circuit. The other components we need are the LED and the 330Î© resistor in series to limit current to the LED so that it doesn't burn out. 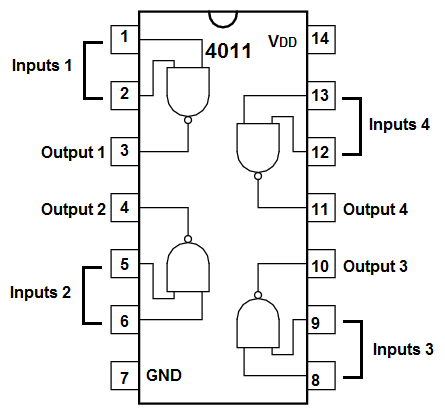 The schematic diagram of the night light circuit using a 4011 NAND gate chip is shown below. The circuit is very basic. The component that allows us to detect light is a photoresistor. We set up a voltage divider circuit composed of a photoresistor and a 33KÎ© fixed resistor. In a voltage divider circuit, voltage is distributed across the components in direct proportion to the amount of resistance each component offers. The more resistance a component offers in relation to the other, the more voltage that will fall across that component. This is shown in the ohm's law formula, V= IR. You can see the direct relationship between voltage and resistance in the formula. The greater the resistance a component offers, the more voltage that falls across it. Conversely, the less resistance a component offers, the less voltage that falls across it. When a photoresistor is exposed to either room lighting or bright, it offers very low resistance. With this lighting condition, the resistance it offers will be lower than the 33KÎ© of resistance that the fixed resistor offers. Therefore, most of the voltage in the voltage divider circuit will fall across the fixed resistor rather than the photoresistor. With more than half of the supply voltage falling across the fixed resistor and this junction being connected to the inputs of the NAND gate, a logic level of HIGH (or 1) will be interpreted by the NAND gate. Since the inputs are tied together, they will be both be logic 1s, so the output will be LOW (or 0). Therefore, with bright lighting, the LED will not be powered on. However, when the photoresistor is exposed to darkness, it has very high resistance, in the order of a few megohms (MÎ©). With resistance this high, most of the voltage from the power supply falls across the photoresistor, with very little voltage falling across the 33KÎ© fixed resistor. Thus, when connected to the inputs of NAND gate, with voltage so low, the NAND gate will essentially interpret the voltage divider as if it were LOW (or 0). When the voltage feeding the inputs of a NAND gate is less than half of the power supply voltage, it will interpret it as a LOW value. Since we will tie both inputs together, the NAND gate will interpret this as two zeros, so it will output a logic value of 1 (or HIGH), which means the output will be drawn up to VCC and the load, the LED, will be powered on.